Interesting fact about the business: Indian Ridge is comprised of two waterfront plants that have serviced commercial fishermen for more than 100 years. Andrew, 57, and his wife, Christine, own Pearl, Inc. DBA Indian Ridge Shrimp Company, which is comprised of two plants right down the road from each other. Both plants have a rich legacy that dates back to the early 1900s. Plant No. 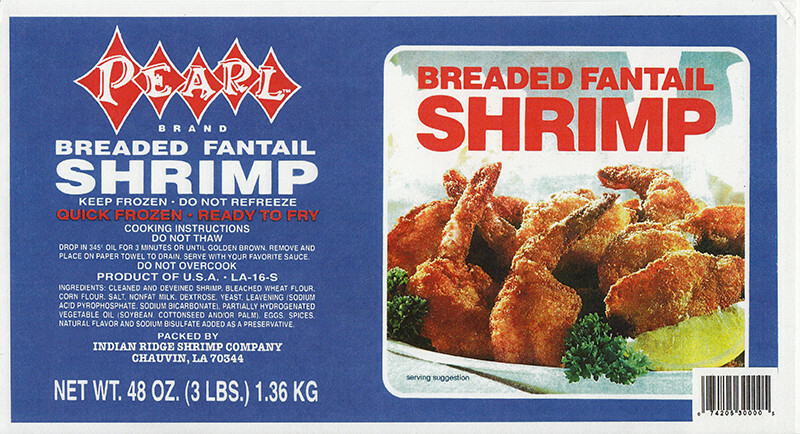 1 started in 1919 by the Chauvin family during a time when peeling, cooking and canning shrimp was a preferred processing method. By 1972, the plant owner was ready to retire, and he sold the business to the George Shuman and Ted Shepherd from New Orleans, who Andrew says were the “godfathers of selling shrimp in this country.” Two years later, Andrew graduated high school and needed a job. Although he spent plenty of time on his father’s shrimp boat as a kid, he never had a desire to join the industry, but since the plant was only 500 feet from his home, that was his best option at the time. Little did he realize he would be walking to the only job he would have for the rest of his life. By 1980, Andrew was manager of the plant, and by 1995, he owned it. He and his first wife, Debbie, renamed it Triple T in honor of their three children: Toby, Todd and Tessie. Shortly thereafter though, Debbie passed away from a brief illness and Andrew was left with a decision as to what the next step would be without his wife and business partner. After taking a few weeks off to be with his family, he came back to the plant and was determined to move forward with a new restructuring plan that Debbie would be proud of, and would secure a future for their children. However, what Andrew didn’t plan for was a restructuring of his personal life as well. Christine was a seafood broker and a blessing in waiting. The following year, they were married, and a new chapter began for the company. Around that time, the owner of Indian Ridge Canning Company approached them about buying his plant, which also was located on the water only two minutes down the road from Triple T. In 2000, Andrew and Christine incorporated their two businesses and Indian Ridge Shrimp Company was formed. The history behind Plant No. 2 can be traced back to 1923 to the St. Martin family, who much like the Chauvin family, owned many of the businesses in the city. Andrew can tell you all about Dr. Hugh St. Martin and the success his family experienced with a seafood canning facility, oyster plant, general store, icehouse, grammar school, and more. Back then, people weren’t paid in currency like today; they were paid in wooden tokens — or “shrimp nickels” — that could be redeemed at businesses, which ironically, also featured the doctor’s face on the tokens. Snapshots from this era in the shrimp industry can still be found in the plant with two pieces of handcrafted machinery that are no longer in use: a grader and capping machine. This grader is different than the modern day mechanism. When canning was popular, cooked shrimp would be funneled through a grader designed with holes to capture shrimp of varying sizes — salad, small, medium, large, extra large, jumbo and colossal. As the shrimp would fall through the different slots, they would be canned and sent through the capping machine, which would apply the lid and create a vacuum seal on the can. Two shrimp processing plants with a combined number of nearly 200 years in operation in a small town will display a remarkable theme of company loyalty among employees. Aside from Andrew’s own tenure, he is proud of his team who boasts decades of commitment and a strong work ethic to ensure a product of excellence is delivered to customers: Anabelle, laborer, 20 years; Pam, quality control manager, 35 years; Lanny, freezer manager, 28 years; and perhaps the most impressive tenure belonged to Arthur “Tutur” Thibodaux. Tutur passed away four years ago, but he worked for Indian Ridge as plant manager for 70 years. Andrew’s team is his family, and one of his greatest joys in this industry is working with Christine, secretary/treasurer, as well as their best friends, Craig Authement, manager of Plant No. 2, and his wife Connie, controller for both plants. They have all worked together for almost 15 years, and the camaraderie among them is a vital part to the success of the business. Andrew’s dedication to this industry is evident through the leadership position he has held since 2007 as the president of the American Shrimp Processors Association, as well as being a member of the Louisiana Shrimp Task Force since 2009. The perk of being located on Bayou Terrebonne allows Indian Ridge to benefit from fishermen who can pull right up to their dock with boats full of fresh Gulf shrimp — more than two million pounds are unloaded a year. The entire process from vessel off loading, grading, peeling and cooking, to packing and freezing, takes no more than two hours, which insures the finest quality from start to finish. Their two plants, 40,000-square-feet combined, are temperature controlled, USDC inspected, and are HACCP certified. In addition to processing headless, head on, peeled and deveined, and peeled and undeveined shrimp, Indian Ridge IQF’s or blast freezes the shrimp, and packs them in 5- to 25-pound boxes for food service distributors, military and institutional clients, or 1- to 5-pound retail ready bags customized for local, regional and national supermarket chains. The IQF tunnel onsite is capable of running 30,000 pounds of product a day, and more than 300,000 pounds of product can be stored in their freezer. Indian Ridge also specializes in diversification with their line, including value added products like cooked peeled and deveined shrimp, as well as breaded shrimp (peeled and deveined tail off or tail on) that are layer packed in 3- or 4-pound boxes, and come in 21/25 or 26/30 count per pound. Products like these are primarily sold to institutional and military customers. Another avenue of diversification is lobster patties — a recipe developed by Andrew and Craig that is made from Maine lobster. Andrew’s daughter, Tessie, supervises the lobster operation, which produces 20,000 patties a day, and his daughter-in-law, Tamara, is in charge of the special ingredients. Indian Ridge began this venture three years ago after experiencing some economic hardships in the shrimp industry. As a result, the lobster patties (two per pack) are now available in freezer sections of Dollar Tree stores all over the country. Sales feedback from customers has been tremendously positive, so plans are in the works for shrimp patties to hit the market next. Indian Ridge has a wide client base throughout U.S. and Canadian markets that includes retail, distributors, wholesalers, restaurants, and military contracts. Andrew takes great pride in the product to which he has dedicated the last four decades of his life and is committed to ensuring his customers enjoy wild caught domestic shrimp for many more years to come. One critical measure that Indian Ridge is taking to ensure customers receive a quality, consistent product from Gulf waters is by educating shrimp vessels on the importance of sustainability and providing the necessary tools to track the product via traceability.